Most of you will already be aware that, although we still represent you on the City Council, we are no longer Labour Councillors. That is because we refused to break our election promises to protect local services and jobs and we publicly opposed Labour’s cuts. We didn’t forget that we were elected by the people of Coxford, Aldermoor, Lordshill and Lordswood, to protect local facilities such as Oaklands Swimming Pool and play centres, not to destroy them. We knew full well that our defiance would have consequences, which we were willing to accept. We knew that we could only continue speaking up for the people we represent and not be gagged if we were no longer members of the Labour Group. We have been overwhelmed with messages of support from local residents and from across the City for our actions and for our decision to become independent Councillors. We don’t believe we’re alone! People are fed up to the back teeth with the present Tweedledum and Tweedledee political line-up and want someone to stand up and speak out. We have discovered that there are innumerable people out there who think the same way as we do. 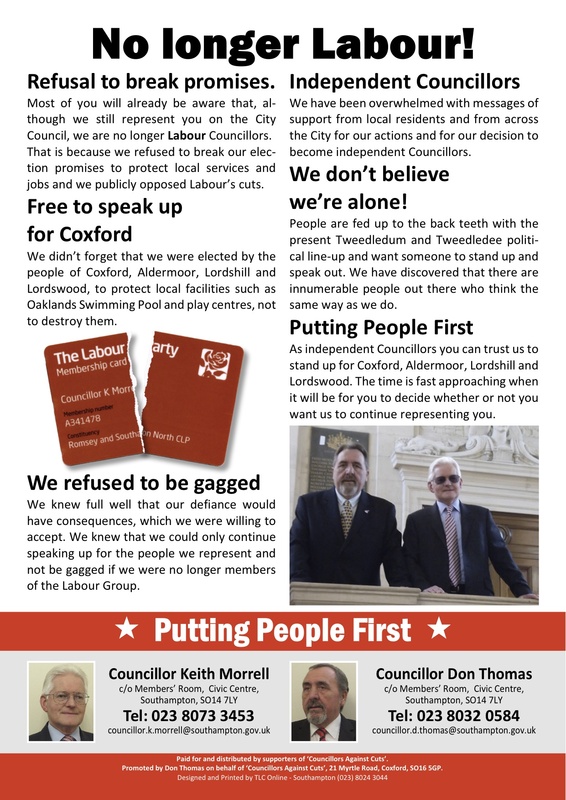 As independent Councillors you can trust us to stand up for Coxford, Aldermoor, Lordshill and Lordswood. The time is fast approaching when it will be for you to decide whether or not you want us to continue representing you. Oaklands Pool Victory – You’ve done it!